THE West Belfast MP Gerry Adams last week paid tribute to a veteran campaigner for the banning of plastic bullets, who passed away earlier this year. The late Emma Groves, who co-founded the United Campaign Against Plastic Bullets, was described by the Sinn Féin President as representing the“indomitable spirit of the many relatives of the victims of plastic bullets”. He called for a monument to be erected in memory of “this strong, resolute and visionary West Belfast woman”. Mr Adams was speaking at the annual plastic bullet vigil at the old Andersonstown RUC barracks site which is held to remember the 17 people, nine of them children, who were killed, and the thousands more left injured, by the lethal weapon. 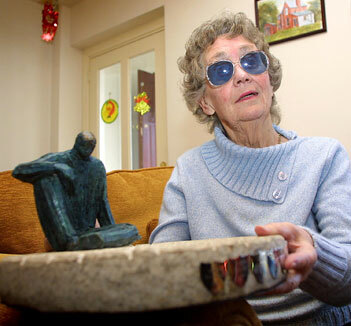 Emma was blinded in 1971 when she was struck in the face by a rubber bullet fired by a British soldier as she stood in her living room. She passed away in April and this year is the first time that the vigil has been held without her. “Rubber and plastic bullets were and are a weapon of terror,” said Mr Adams, “deliberately used by the British state and its agencies to intimidate and terrorise citizens. “Since its formation after the killing of John Downes in August 1984 the United Campaign against Plastic Bullets has held a vigil/picket at this spot each year to remember the many victims and to demand the banning of this weapon. “Foremost among those who stood here, year after year, in good weather and bad, was Emma Groves. “With her friend Clara Reilly, Emma had founded the United Campaign Against Plastic Bullets. And along with Jim McCabe, whose wife Nora was killed by a plastic bullet in July 1981, and John Downes’ wife Brenda and others, they waged a relentless campaign here and internationally against this weapon and in pursuit of the truth about its use. Mr Adams said that Emma never allowed her disability or her age to stand in the way of her speaking out against plastic bullets and travelling the world to lobby for their banning. “Emma addressed the European Parliament. She travelled to Russia and to the USA demanding that the British be held accountable for their use of this weapon. “She travelled to Scotland, along with other relatives, to picket the factory where plastic bullets are made. “And she addressed the shareholders of the production company in America, which decided immediately to discontinue their role in the production of plastic bullets. “She spoke wherever people would listen, telling her own story and demanding that plastic bullets be banned. “I have no doubt that the progress we have made, including Hugh Orde’s acknowledgement of the hurt resulting from injuries and deaths of innocent people, including children, would not have been possible but for the efforts of Emma Groves and her friends,” said Mr Adams. Gerry Adams said that it would be fitting to erect a monument to the inspirational campaigner at the landmark barracks site. “Her loss, her absence, is felt by all of us who knew her well and who stood here with her each year,” continued Mr Adams. “But she remains someone from whom all of us can draw inspiration and encouragement in our lives. “Emma was dedicated to her own family, and they to her. “And we should say thank you to them for the support they gave her, but her love and compassion for all of us was equally remarkable. “Emma was a great woman. I am proud and honoured to have known her. “I believe it is right and fitting that in time a monument or something which would honour her memory should be erected on this spot to remind us all of this strong, resolute and visionary West Belfast woman whose courage and bravery is an inspiration to us all. Tributes were also paid to Emma by her long-time friends and colleagues Clara O’Reilly, Jim McCabe, whose wife Nora was killed by a plastic bullet, and by Mary Pearson of the Troops Out movement. Emma’s daughter, Jane McGuigan, also spoke and her granddaughter, Maureen Butler, read a poem. Music and song was provided by Roisin McAliskey and Eamonn Ó Fagáin.